October 21, 2013 October 21, 2013 k3fit2 Comments on Meatless Monday – Sweet Potatos can be Burgers too! 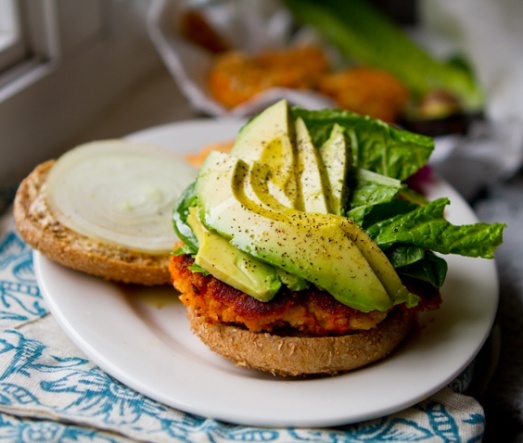 Meatless Monday – Sweet Potatos can be Burgers too! Sweet potatoes are a fall favorite but they do not do your waistline any favors when they are covered in butter/sugar/salt/marshmallows, try embracing the sweet potato and all of its health benefits by trying this sweet potato burger recipe. I have made these delicious burger patties many times and they are easy and fun! You can put them on a grilled whole grain bun or wrap or you can go green and wrap in a lettuce leaf or red cabbage leaf and enjoy like a taco! You can make several ahead of time for quick lunches or dinners for the week! 7. Serve on toasted bun with lots of toppings like raw or grilled onions, mushrooms, tomatoes, pickles, avocado, carrot slices, Dijon mustard, spinach leaves. The list goes on! Try it today and let me know how you like these! Looks good and I’ll be sure to try it! im definitely making these very soon! Next Teach Your Kids Tuesday: FLU SEASON!